What’s In San Diego’s best Golf Coach’s Golf Bag? Home / What’s In San Diego’s best Golf Coach’s Golf Bag? Understanding shaft selection – All golf shafts bend forward into the ball as you approach impact. In stop-action photographs, it looks like the clubhead will arrive at the ball while the middle of the shaft is far behind, like the letter C. Because of this, softer shafts hit the ball higher and lefter, while stiffer shafts hit the ball lower and righter. So if you slice the ball, a soft shaft would make your slice less pronounced, but you should not select your shaft to compensate for a flaw, you should select it based upon your clubhead speed. If your clubhead speed with a driver is less than 95 mph, you should play with a regular shaft flex. If your clubhead speed is between 95 mph and 105 mph, you should play with a stiff flex. Finally, only if your clubhead speed is over 105 mph should you use an extra stiff (X) flex. The better you get, the more you will benefit from the specific flex pattern of a custom shaft. You can “dial-in” a trajectory based upon your swing speed. Finally, keep in mind the correct relationship for overall weight in your driver-fairway wood-hybrid shafts is “10-10-10″. For example, if your driver has a 60g shaft, your fairway woods should have 70g shafts, and your hybrids should have 80g shafts. Sometimes it is hard to get it exact, but do the best you can. Mine, for example, are 70g, 80g, and 93g. Other pros teaching golf lessons in San Diego do not go the extra mile in picking out what the best equipment is for the skill level of the student. TaylorMade MC (2014 Model) 3-PW A little perimeter weighting on a set of irons makes them more forgiving. However, if a little is good, more is not always better. You will get diminishing returns and the club will start to look large and unattractive. The eye appeal when you look down at the club is the most important factor for a better player. Also, I recommend you either get forged irons or cast irons with the notch in the hosel that will allow them to be bent easily. Any set of irons that look good and have the right shafts for you cannot fail to be effective if the lies and the lofts are set correctly. All woods, Hybrids and irons are standard length. The bounce angle on your wedges is important to fit properly. If you have a normal angle of descent on your partial wedge shots, a sizable bounce of 8° to 10° will benefit you, keeping the club from “digging.” In addition, you need bounce on any wedge you plan to play from a greenside bunker. Whenever I have a greenside bunker shot, I take both my 60° and 54° to the bunker with me. If the shot is short (40′ or less), requires height, or stopping power, I will use the 60°. However, longer shots that require less height and can roll out are hit far more easily with the 54° club. Players who use a shallower angle of approach on partial wedges sometimes prefer a lesser bounce angle. This is fine as long as the ball is hit while the club is still descending to some degree. The attempt to “slip the club under the ball” to get it up fast is an erroneous concept. A scooping action, causing both fat and thin shots, is the result. In addition, a 60° wedge with 4° of bounce would never be as effective a club from the sand as one that had more bounce because of its tendency to “dig”. There are two factors affecting the lies of your clubs. First, centrifugal force raises your hands slightly at impact in relation to where they were at address. For a good player, this can be as little as 1 inch. For a less skilled player, the hands may be 6 to 8 inches higher at impact than where they started. Second, the shaft “droops” when you swing it. That means that viewed from the “down-the-line view” the shaft bends at high-speed in a direction that makes it look almost like you were holding a piece of rope with a weight attached to it. 3° to 5° of shaft “droop” or deflection in this direction is very normal, and for softer shafts, up to 10° is possible. As a result of these two factors, if you were to sole the club flush on the ground at address and make a normal swing, the toe of the club would hit the ground first and twist the club open at impact. 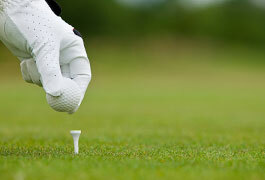 That is why the hands should be set lower at address so that the toe of the club is slightly off the ground. Still, raising the hands through impact is such a prevalent fault that if you are fitted using a “lie board”, nearly always you will be told your irons need to be bent significantly upright. Although you may get some temporary relief from toed or pushed shots by this over-bending, in the long run it will work against you. As your swing improves and a lower hand position at impact is achieved, overly upright irons will cause severe pulls and hooks. As a result, you should bend your irons according to your fingertip-to-the-ground distance more than what a lie board seems to be telling you. 1° flat or 1° upright would not be a major problem, but be very suspicious if you are told your clubs need to be 3° to 6° upright. I have my own lie and loft bending machine to make sure the specifications of my clubs are perfect and I am happy to precision bend a set for one of my students. What other golf lessons in San Diego offer that kind of service? It is not uncommon for the manufacturers to have their clubs differ significantly from the listed specifications, so getting your clubs checked by someone who has an accurate machine is a great idea. Finally, tall people have longer arms and shorter people have shorter arms. That means that nearly everyone’s fingertip-to-the-ground distance is the same. As a result, it is a bad idea to get your lies bent a long way from what is standard, and an even worse idea to have your clubshafts shortened or lengthened because you think you are much taller or shorter than normal in height. Titleist Pro V1X (low numbers only) Marked with a single black dot below the number on both sides. I carry 6 to 10 new balls with me to play a full round, depending on the golf course. You should use a minimum of three per round, putting new ones in on the par fives, because a fresh, new ball goes further. Don’t clean your ball with a ball washer, because it takes the glaze off the ball. It is that unblemished, shiny glaze that allows the ball to slip aerodynamically through the air for maximum distance. Instead, wipe the ball off gently with a damp towel. If your ball is damaged in any way, by hitting a tree, cart path, or sandpapered by a bunker shot, retire it immediately! Start a shag bag with those retired balls so you can putt and hit short wedges with the same ball you play on the golf course. Golf ball performance is all about a trade-off between distance and spin. The balls that go furthest do not spin and stop on the green very well and the balls that stop best do not go as far. That is why the premium balls that have the best combination of distance and spin are more expensive. Most people play an inexpensive ball that goes far but performs poorly around the greens. Before you decide on the best ball for you, don’t just see how far it goes, also hit a few shots over a bunker to see whether you can get a well-struck shot to stop. Once you have settled on the best ball for you, it is extremely important that it remains the ONLY ball you play. Any other ball you hit will have different distance and spin characteristics. So if you are the kind of person who finds a few different kinds of balls in the rough during a round of golf and puts them into play, you are ruining your ability to judge how far your shots will go. Gloves are stored in a freezer bag size Ziplock bag, not sealed. Gloves should fit snugly when they are first bought. They will stretch out as time goes on. If you can completely close the Velcro when you first buy it, it is probably too large. In high school, I wore a medium large size glove. Now, even though I am 6’2″, weigh 180 pounds and wear a size 11 wide shoe, my glove size is men’s small. Regular cut means you have standard length fingers and standard hand thickness. Cadet cut is designed for those who have shorter fingers and thicker hands. Try all gloves on before you purchase them. Make sure they fit snugly, but do not bind. Also, if the seam on the thumb is in front and between your finger print pad and the club so you can feel it when you press down with your grip, do not buy that glove. The seam should be back over the top of the thumbnail and out of the way. +Nexcare first aid tape. Flesh colored, stretchy, definitely the best. +Superglue – Have a split or a cut and don’t like the bulky feel of tape on the course the way you would on the range? Superglue was developed during the Vietnam war to close wounds. It works (dries) fast and will last the round for sure. A great alternative to tape. +50 Band-Aids, assorted sizes from very small to very large. +Sunscreen – I use the 30 SPF clear spray in the morning, but carry a tube of 100 SPF cream in the bag. Reapply liberally. +StingEze – 5% benzocaine 1.35% phenol. External analgesic/antiseptic for quick insect bite relief. It works! I carry this in case someone in my group gets a bee sting. However, I do not carry insect repellent because there are no mosquitoes in Southern California. +A bottle of 40 10mg Zyrtec allergy pills. Available OTC. Just in case something is in bloom to which you have an allergic reaction. +A spare pair of contact lenses. +Vivarin caffeine pills – Ever played a round on a hot day, felt a little tired afterwords, and still had an hour drive to get home? Don’t nod off, crash your car and die! Take one of these and you will be alert and awake for 4 hours guaranteed. + A few spare solid silver quarters to mark my ball. + Golf pencils – All must have you erasers! If you have ones from a course that is famous, that is definitely cooler! + A black sharpie to mark my golf ball. + Adjusting wrench for woods/hybrids. The TaylorMade and Titleist models are interchangeable and work for both. The argument for and against the two rangefinding systems is based upon the concept of how soon and how much you have to guess. GPS was first on the scene, using a satellite feed to give you every yardage you could ever hope to want, except the one you need most, the one to the pin. This is because all the other landmarks on the golf course remain stationary, but the hole is changed every day. Some advanced GPS systems at high-end clubs try to allow for this, but normal GPS that you would get on your phone or wristwatch cannot truly give you the pin. Lasers, on the other hand, fire a beam that will give you a precise yardage to anything you can lock onto. If the pin has a reflector, it is very easy to do this. If not, some expertise is required. It is always a good idea to acquire the pin with a laser rangefinder and then miss it on purpose to make sure you get two different readings. If you don’t, you run the risk of missing on the first try and hitting, for example, the hillside behind the green, thinking you got the pin instead. GPS is popular because lots of nice courses have it built into the cart. The problem with it is that it requires you to make one extra guess. For example, if you laser the pin to 158 yards and also laser the front bunker carry of 141 yards, you have a rock-solid basis from which to begin guessing how much the other factors will affect the distance it will PLAY. Those three factors are: Uphill or downhill? Into the wind or downwind? Good lie or bad lie? A Tour caddy would never advise his player to add or subtract a club or a half a club, because that is not precise. Half a club for Tiger Woods and half a club for most golfers are very different distances. Instead, you might hear him say something like there is 10 yards of “hurt” because the shot is into the wind and five more yards for the uphill. Adding 15 yards to the original 158 yards gives you a total that the shot will PLAY, equaling 173 yards. Granted, assessing the wind and the upslope constitute a guess, but the original pin and bunker yardages were exact. When I play in a cart that has GPS, I always compare the exact laser yardage to the pin with what the GPS gives me. As a general rule, I would say that half the time the GPS is within 5 yards of being correct, 25% of the time it is between five and 10 yards of being correct, and the other 25% of the time it is more than 10 yards off. If you are more than 10 yards off 4 times a round before you begin guessing about wind, slope, and lie, the potential for a too long or too short disaster looms large. If you try to make the argument, “It doesn’t matter that much for me, I cannot hit my clubs precise distances,” you are actually making the argument that it IS more important for YOU not to be 10 yards off to begin with. In short, even though GPS seems cool because of its simple convenience, and is better than nothing, it is simply inferior to a laser rangefinder and is seldom used by better players. Fitting golf shoes can sometimes be a problem. Let me make this clear, if you get a new pair of shoes and you get blisters before you have “broken them in,” they are either too small or too narrow. A friend of mine in the industry told me the best test to see if your shoes fit properly is if you can take your index finger and put it between your heel and the back of the shoe all the way down to the second knuckle with ease. You may feel as though you are “swimming” in them, but that is the correct fit. If you get shoes that seem snug so there is no such movement when you buy them, your feet will swell when you walk, the shoes will rub somewhere, and you will get blisters. Because I walk approximately 90% of the time when I play, I am ultra-sensitive to this effect. I used to wear smaller and narrower shoes when I was in college that often hurt my feet. Not anymore. Larger and wider means more comfortable. You will never need to “break shoes in” and get blisters if they fit properly to begin with. Foot-Joy Roll-Tops (all white) These low-rise socks are thick and comfortable. Plus, you avoid the mid-calf tan line. There is one thing to remember, especially if you are wearing shorts. White shoes, white socks. Black shoes, black socks. Mixing them looks terrible! To play effectively in the rain, I think there are five pieces of equipment necessary to gain an advantage over the elements and the competition. First, a rainsuit. You need both a jacket and pants. Water resistant means the suit is light-weight and will keep the water out pretty well, but not completely over time. Not uncommon to get a rainsuit of this kind for $100 or less. Can be ideal for areas where it rains very little, not very hard, and stays warm. Next, waterproof. This is a much sturdier kind of suit that is both warmer and drier. $100-$400, depending upon the manufacturer. Finally, Gore-Tex. This is the highest grade suit that is both super warm and super waterproof. If it’s raining in Scotland or the Pacific Northwest and you don’t have one of these, you would be at a severe disadvantage. Unfortunately, they can cost $500 or more. Second, a good umbrella. Make sure you get the larger size with the flexible stays so a wind gust won’t turn it inside out. When you are finished using it, make sure you put it into the little sleeve on the outside of your bag and not inside with the clubs so the shafts and grips won’t get wet. Third, a rain hat. A regular ball cap will not do the job because when you are over a shot or a putt, you will feel the cold rain going down the back of your neck. Try to get something with a wide brim that goes all the way around to avoid this problem. Fourth, rain gloves. Unlike regular gloves, which are worn only on the left hand and made of Cabretta leather, rain gloves are worn on both hands and made of cotton. Regular gloves get slippery when wet and become very difficult take on and off. Rain gloves do not slip when wet and stay on. If you have not played with gloves on both hands, it is a bit of an adjustment at first, but a huge advantage if you have them and others do not. They need to be wet to be effective. If it stops raining and they start to dry out, they work less well. Finally, your club cover. This might be the most important item in your foul weather arsenal but is seldom used. It is the little hood that comes with your golf bag when you buy it that most people throw in the trunk or lose immediately. No matter how dry YOU are, if you have rain going down into your bag making your shafts and grips wet, you will not be successful. Keep it on and zip it up between shots. One final option is a hand warmer. There are two kinds: the chemical ones that last for a few hours and are disposable and the rechargeable electric ones that will last for a full round very easily. I saw one recently that was about the size of a disposable lighter and it was incredibly warm. Ping Hoofer (all black). If you carry your bag and walk, having a lightweight bag with a good stand and strap system is imperative. Ping has always made a great carry bag and every time you buy a new one, there always seem to be multiple improvements over the previous model. If you typically ride a cart, a larger, heavier bag with more room is just fine. The headcovers that come with most new clubs these days consist of a stretchy sock attached to the cover that is difficult to get over the clubhead with ease. Any headcover that takes more than a second to get on or off is annoying and a waste of time. I think it’s nice to have them all match and look good with the rest of your bag, but convenience and ease of removal is the key. I have black leather ones with the faux fur inside on my driver, 3-wood, and hybrid. Same thing with the putter, except that one has a little Velcro to hold it closed. All four of them match each other, my bag, and have the Torrey Pines logo. I bought them in the shop at Torrey and was very surprised to see how inexpensive they were. They are on and off in a flash. Keeping your clubs clean is not a cosmetic issue, it is a performance issue. The grooves on all club heads channel away the grass and moisture at impact to provide optimum height and spin. If your grooves are filled with dirt, all shots will stop on the green less quickly, especially from the rough. In addition, the chemicals in the soil will take the chrome off your irons and the paint off your woods and hybrids, effectively reducing the lifespan of your clubs by as much as half. Finally, the look of a perfectly clean club is highly desirable to the better player. Once you get used to looking at that, you won’t settle for anything less. I keep the black towel wet to clean my clubs after every shot. I keep the white towel dry and take it with me to the green to clean the ball before I putt. Having one towel that is always clean and dry is nice if you ever need to wipe your face or hands. 1961, 1962, 1963, or 1964 solid silver quarter. I think it is nice to look down at a low number when you mark your ball. Quarters from 1965 to the present are made of an alloy of nickel and copper. The ones from 1964 and earlier were made of solid silver. I get them at a coin shop for around $8 each, it is my guilty pleasure. Golfaide divot fork. It is a divot fork on one end and a spike wrench on the other. I have had the one I’m currently using for around 20 years. 2.75″ The driver is the only club that does not hit the ground at impact. To launch the ball at the optimal height for maximum distance, tee it up so that one half to three quarters of the ball is above the top of the driver at address. On par threes, tee the ball down low so that it looks like a perfect lie sitting on top of the grass. Your contact and consistency will be far greater off a low tee than off the ground. Which Clubs Should Be In Your Bag? + A driver with the loft set for optimal launch angle and distance. + A 60° wedge with the correct bounce angle for you. + A putter with enough loft to get the ball to roll properly. Your 3-wood goes farther than any club in the bag except the driver and can be hit off the ground. Like the driver, it must be hit high enough to go to maximum distance. They vary from 13° to 17° of loft, with 15° being the average. If you have selected the correct loft to match your clubhead speed, a well hit shot that hits the green will roll no more than 15′ from where it landed. Most people also carry a 5-wood, which should have approximately 4°-5° more loft than your 3-wood. These clubs are designed to replace the long irons. For a long iron to be an effective club, it must fly high enough to go the correct distance and stop quickly on the green. They offer the better player superior control, but with insufficient clubhead speed the smallish heads will not elevate the ball. Hybrid heads look like mini- fairway woods with a low center of gravity that gets the ball up in the air much more easily and are very forgiving. They are a great choice from the rough or fairway bunkers. My clubhead speed with a driver is 108 mph, so I use both a 3 and 4 iron with only 1 hybrid. Most players should carry two hybrids, with lofts of approximately 19° and 25°. Fairway woods and hybrids are adjustable just like drivers, so you will be able to dial in the correct height and distance for each club. The final seven clubs in your set will fill the gap between your 60° wedge and your 25° hybrid. I have a 6° gap between my 60° wedge and my 54° wedge. Then, another 6° gap between my 54° wedge and my 48° wedge. From there on, all my clubs vary 4° per club. Many players prefer their most lofted clubs to vary by 4° instead of by 6°. That set would contain 60°, 56°, and 52° clubs. The loft for the same club may vary widely between manufacturers. Some pitching wedges are turned down to 44°or 45°. So depending upon how you configure your set, your longest iron may be a 6 iron or 5 iron. Simply fill in the last seven clubs evenly with the clubs that are offered by the manufacturer you have selected.